An atheist walked into three churches last Sunday. I know. Sounds like the beginning of a great joke. In fact, you could probably come up with an awesome punch line. Jones walked away with a great appreciation for communion and prayer. While he was not converted, he was most affected by the way in which churches welcomed him and gave him a sense of belonging. I believe Jones experienced what every single one of our churches is trying to offer. We all want to do the work of Jesus by welcoming others like guests in our home. I’ve heard that phrase a lot lately as my own church seeks to reach the community in more meaningful ways. Like guests in our home. It’s a wonderful analogy, isn’t it? We roll out the red carpet for houseguests. We offer them our best food and drink. We break out the fine china. Heck, we even let them use the special towels that normally stay locked behind some sort of invisible force field in our bathrooms, never to be touched by an actual family member. I’m afraid the mindset behind our welcoming spirit might slowly, subtly be killing our church. Don’t get me wrong. I am not saying our churches should stop welcoming visitors. And I’m not saying church shouldn’t feel like a place where you belong. What I am saying is that we need to stop viewing our churches as our homes. And here’s the reason. While I am very welcoming to my guests, I also see my home as mine. A possession. You probably do, too. And so I create rules and expectations to protect it. I’m kinda’ particular about the grass. The mower lines should run diagonally. And the spoons should never “spoon” in the dishwasher. Kids should never eat in the living room. And I’m fairly certain that failure to use a coaster is acceptable grounds for divorce in 36 of the 50 states. These rules are our custom, and we’re unlikely to adapt quickly. When we do have parties for others, we relax these rules. We also vacuum the carpet, mop the floor, and scour the kitchen to make things bright and shiny for our guests. All the messy stuff stays behind closed doors or tucked away in closets, just waiting to pounce on someone who mistakenly thinks it’s the entrance to the bathroom. Finally, while those parties may be absolutely fantastic, I have to admit that they usually only happen on the weekends, and they are normally limited to friends of friends who we know will enjoy each other’s company. But during the week, the house is largely empty, save for immediate family. Again, please don’t misunderstand me. Our churches do amazing things. We go on mission trips. We sponsor charities. We bring the gospel to people desperately in need of a “good news” story. But the truth is, when we think of the church, we see it as ours. Like our home. A possession. We have rules and traditions that start to take on a God-like quality in the way we worship them. Then we wonder why some see Christians as rigid and inflexible. We primp and prime for the big party on Sunday and greet folks with big smiles, while hiding the messy realities of church life in the closet. Then we wonder why some see Christians as lacking authenticity. We spend roughly 82% of our church budgets on staff and buildings that are only open a few hours per week, mostly for programs designed specifically for our members. Then we wonder why some see Christians as selfish. And every time I hear this, I cringe a little. Please don’t misunderstand me. Families are beautiful. My own family is incredibly welcoming. At the same time, we’re also loud and boisterous and overwhelming. We have inside jokes and tired old stories. If you’re spending Thanksgiving with us for the first time it can be downright exhausting. And exclusive. As an outsider, you are left to try and quickly understand decades of history and assimilate quickly. The sad truth is, we ask our church guests to do the exact same thing. We absolutely want them to be members of the family. We invite them warmly. But rather than meet them where they are, we ask them to meet us where we are. The result? Those who are drawn to us, and therefore drawn to Jesus, will be those who tend to worship like us, believe like us, and look like us. Threading the impossibly narrow eye of the needle. And we wonder why church membership is declining. We are here to support God’s creation. As stewards. And it’s time we recapture that call. As church leaders, we must begin to see ourselves as caretakers of sacred ground rather than owners of a house. 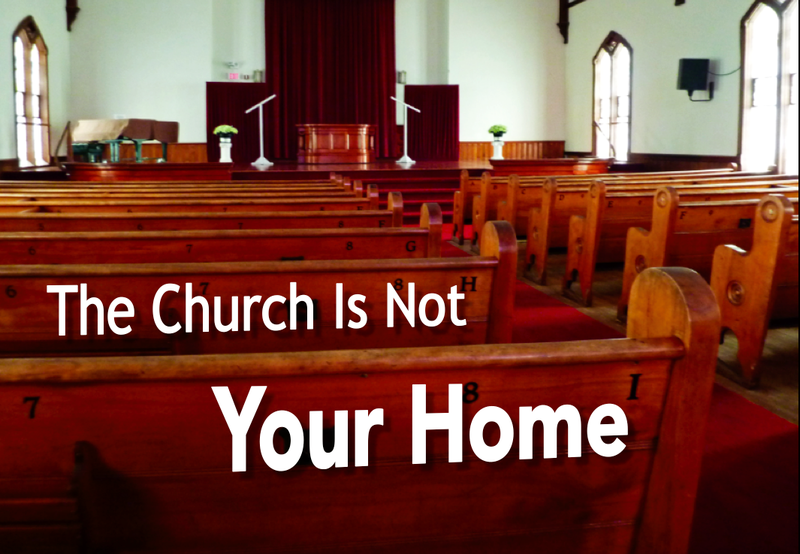 Because the church is not our home. We do not possess it. We shouldn’t try to tame it any more than we should try and reign in nature. Consider the parks where gates are wide and all are welcome. This is what our churches should be. Open to all at any time. Some people come to work. Others come for recreation. Still more come to rest. The caretakers of such spaces don’t care why you are there. They only want to assure that, no matter the reason you have come, you will feel the beauty and magnificence of Our Creator. They also hope the beauty you experience will be so real, so palpable, that you have no choice but to share the experience with others. Like vacation photos of the Grand Canyon that never quite do it justice. There are glimpses of this in our own communities. Some churches operate food pantries. Others have given up their buildings altogether to provide transitional housing for those on the margins. I think of a recent Monday night at my own church, where a dozen homeless men slept in a fellowship hall, while Alcoholics Anonymous met in a preschool classroom, and a community development meeting took place in the sanctuary. Not a single event for church members. But the family of God was there. So I pray today that this will be our call. That we may tirelessly look for ways to be caretakers of the church where we serve. To look for ways to use our buildings and our gifts not for ourselves, but for others. And in so doing, may the light of Christ show through our generosity. Our openness. And our selflessness. Reaching out to the family of God. * Enjoy this post? For more, just preorder Scott’s book about his family’s Year Without A Purchase on Barnes & Noble or Amazon launching August 4th from WJK Press. And, to see more posts like this, submit your email at the upper right to receive new blogs hot n fresh to your inbox. Or, Like us on Facebook. Cheers! My Pastor taught me that the church is a “Filling Station”. It is where we go to get recharged, revitalized and educated. Then, when we leave the church…at the exit onto the street…there should be signs that say “Entering the Mission Field”. I agree with some of your post but not all of it. I love my church “family” and by that I mean the welcoming me where I was when I went–not at where they were. If we are welcoming guests in, we should be accepting them as they are. Maybe my church is different than most–I hope it is if this is not what the others are doing. I am sure my “family” isn’t always on their best behavior outside of church. They are sinners after all. But, when I am in church, I couldn’t feel more loved than my own family–on their good days:). While I would not want the members to feel comfortable enough to make the messes they might make in their own homes, I recognize a lot of our lives are messes. I am glad I have a church family that let’s my internal messes be released without shame or guilt. We all have messes at some point. I want to be in a church that I feel cares about me and my messes and not a superficial church that only cares about attendance and why membership is declining. There are several reasons why church membership is declining. I think making them feel welcome and accepting them where they are is a start. If you feed them (emotionally and spiritually) they will come. I’m afraid so many non-church goers see us as hypocrites and judgmental. Of course we are, we are human. We are sinners. Being a Christian doesn’t make us perfect. It only means we are trying! Per usual, you are brave and articulate. Thank you for your heart. Scott, this is good food for thought and reflection. I really liked this piece. Will we dare to take this one step further and ask what would have happened if our friend the atheist had “walked into” 3 Jesus Christ-followers last Sunday?? What would he have found?? Welcome? Compassion for his separation from God? Willingness to listen? Boldness to preach the gospel? Jesus said WE are the church; the building is not the church, we just mistakenly call it that. If the Christ-followers are the church, then church doesn’t happen just on Sunday, and “programs” become defunct, don’t they?? I love what you’ve managed to bring out by writing this, Thankyou. My husband and I have been on cattle stations for the past 15 years, getting to church when we can because of distances and working around seasons etc. now we’ve moved to town and we have been able to attend the church I grew up in, 21 years after I left. They are EXACTLY what you are talking about here. One big happy, welcoming, yet cliquey, family. We go, Sunday after Sunday, saying the pefuctionary hellos, never feeling like we belong or will ever fit in, and it’s not for want of trying! My dad is even a elder there. Love the teaching, the worship, the singing, but the social/friendship aspect has made us very disallusioned with church in general. If one reads the book Pagan Christianity, we will see where Christianity adopted its pagan ways. We will also see that have come to define church as an action..gong to church… my church…etc.Church the body of Christ should be fellowship with one another. Scott, I read this piece in HuffPost this week. I appreciate what you are trying to do here, but I don’t see a problem referring to the church as a family, or treating the church “building” as we would a home. The church is a family because as believers we are adopted into the family of God. (Gal 4:5 etc) Since we are a family I don’t see the problem treating the place where the family meets as a “home.” We may need to correct how we act as a family or how we utilize our home or how we treat those who are outside the family but I see no problem with the paradigm of a family and home. I read the study about how much churches spend on personnel and facilities. That was interesting. But there is an important difference between a church and a charity such as Red Cross. When I give money to Red Cross my goal is to get food, clothes, money, whatever, into the hands of the poor. That’s their ministry. (Forgive me for oversimplifying.) But the ministry of the church IS the personnel and the facility. I give money to my church because I want a pastor(s). I give money to my church because I want a place to worship and fellowship and share communion and perform baptisms. In other words the money the church spends on personnel and facilities is not overhead. Personnel and (to a degree) facilities is what the church is about. Of course we should be wise in how we spend our money on these things but there’s nothing inherently wrong with it. Those are my opinions on the subject anyway. Could not have said it better myself. People need to look around themselves and see what’s really going on.